to interact with customers across digital channels. 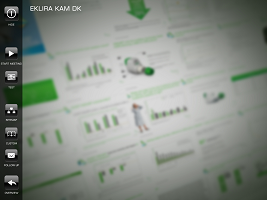 HCP´s increase time spend researching professional issues online and decrease time spend meeting with sales reps. This is a trend we expect will continue in the years to come. Many industry players have responded by cutting the sales organization – it still remains to be seen if that is the road forward for the industry. We believe in the future of the rep – however we also believe that the role of the rep has to change. From selling to consulting and facilitating. From intrusive brief canvas meetings to appreciated planned interactions that add value to the HCPs delivery. Engaging with eHealthNordic means working with senior people with decades of management experience and a proven track record from within the pharmaceutical industry. We are focused on optimizing the performance of sales and marketing activities. We offer a number of services to support the process of implementing multi-channel activities. Increased performance is the result of successfully empowering the sales rep with new channels to interact with his customers and by reevaluate the traditional goals of the rep in the light of the multi-channel reality. The digital revolution has changed the convention of business across all industries. The Pharmaceutical industry is also faced with new ways to market products and new channels to interact with doctors, patients and other stakeholders. For most companies this change is a journey. The challenge for most players is the management of this change – it is a people thing whether these initiatives will prove successful and sustainable. At eHealth Nordic we help pharmaceutical companies embrace the new opportunities, accelerate the transition and avoid the barriers and obstacles. We offer workshops on Digital Strategy & Tactics and Leveraging your Sales force. Often when implementing new initiatives organizations experience an extra workload before the initiatives have proven worthy of replacing older activities. During such a phase it will save you time to have resources with experience of implementing, measuring and training your staff to ensure that the new initiatives are well established in your organization. At eHealth Nordic we offer Interim Management for shorter or longer time periods, during a project implementation or to assist as extra resources during a organizational build up, vacancy or similar. We offer content development services to get you started with Virtual Selling, add value to your existing detailers or help brief your local agency to optimally utilize the opportunities in iPREZENTR™ in their executions. We have the experience of breaking down product information, studies and claims into classic detailing USPs. Two critical barriers in pharmaceutical marketing are often legal and regulatory constraints. We have years’ experience in ensuring that digital activities are compliant with rules and regulation and have in-house regulatory capabilities. Creative executions from us typically include a regulatory review that prepares you for your subsequent internal review committee – saving time to market. If you produce your detailers yourself or use a local agency, we will send you a 1-pager with a specification on how to structure the content to be used in iPREZENTR™. When you start converting your communication to digital assets, there are important learnings that should be taken into account. There are great opportunities of capturing important data when interacting with your customers using a device or meeting them online. We are happy to brief your staff or agency on technical and behavioral best practices so you get the most out of your detailing investment. 4 channels in 1 tool – Tablet-, Self-service site, Self- and Remote detailing. eHealth Nordic has extensive know-how in Virtual Selling. The team behind eHealth Nordic spearheaded tablet detailing back in 2005.
iPREZENTRTM is a Virtual Selling solution which empowers your sales force by providing them better insight into customer behavior and enables them to engage with customers through multiple channels. Virtual Selling help increase the reach, speed and yield of the sales force by supplying them with more strings to play on when it comes to customer interaction. It can ensure that the customer interaction will be tailored to their needs of time, place and content. iPREZENTRTM essentially helps you optimize your resources used with the physicians – offline (face-to-face) and online through Self- and Remote sessions. Is an easy-to-implement solution for managing Virtual Selling. The system covers self-detailing, remote detailing and Tablet detailing. Helps sales & marketing get access to no-see HCPs with self-detailers and trigger on-demand remote detailing sessions with Topic Experts. Captures data from all channels which is accessible through a web interface tailored to individual users. Is an open tool where you can upload HTML5 detailers and other materials developed by own staff or local agencies. Enables a real-time view of the sales activities taking place in the market(s). Reuses content across channels (Tablet (iPAD), Remote- and Self-detailing) – saving time and money. Is a low cost solution that requires no integration with existing systems. The basic idea behind iPrezentr™ is to produce a single detailer that works in multiple channels in which you interact with Customers. Using data tracking tools like iPREZENTR™ allows you a strategic approach to self-detailing. During a Face-to-Face call or a Remote meeting, the structure and flow of the messages are mainly controlled by the sales representative. Even if the sales approach is centered around “Need based Selling” the sales rep has the main control of the messages shown. When the HCP performs a self detailer in his/her own time, you will most likely see a different pattern of slides used and time spent. This will give the you better insight into the real need of the individual HCP at that given time. 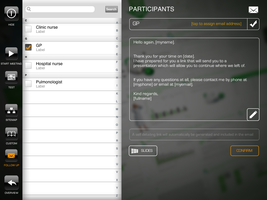 Self-detailers can be triggered after a Face-to-Face call where the sales rep can compose the slides, references or documents that he wish to share with the HCP or a Self-detailer can be used as an initial contact form to screen interest areas and potential of the HCP before planning the next channel of interacting with the HCP. Self-detailers are prepackaged intelligent presentations that are initiated by the HCP by clicking a link in an e-mail. Self-detailers are consumed by HCPs when they have the time and inclination. Self-detailing can be particularly advantageous in markets/areas where reach and frequency of contact is low and where the HCP would normally not meet a sales representative. When using iPREZENTR™ you receive valuable data tracking feedback that indicates how and to what extend the HCP have engaged with the information. Moreover, information about which subjects were covered and any responses to questions in the presentation is captured and sent back to the sales organization. Retrieving this information enables the sales representative to prioritize the level of interaction with that particular HCP. Self-detailing enables unprecedented reach and high velocity getting initial contact with HCPs. In many cases a remote detailing session is a natural follow-up to a self-detailer – in other cases it requires a Face-to-Face meeting at the premises of the HCP. Most remote detailing systems have aimed at recreating the framework of a Face-to-Face meeting, by inviting the customers into an online meeting room. These web meetings do serve a lot of purposes, but when it comes to tracking of customer behavior or giving the customer the liberty to interact with the presentation or the sales rep when he wishes, the web meetings fall short. Our Remote detailing tool is based on co-browsing sessions, where both the sales representative and the customer(s) are browsing the same page. Where ever the customer moves his cursor or which information the customer enters will be tracked and reported back to the system and can be accessed through the data visualization module. A remote meeting can be triggered by the sales representative, by planning a meeting and sending a unique link to the customer. However a remote setting can also be triggered on you website when you have visitors requesting an online meeting. As is the case for both iPAD- and Self-detailing, the content for Remote detailing is the same HTML5 detailer which is accessible online. For more digitally advanced companies there are opportunities for implementing personalization tools which creates behavioral profiles on your customers, detecting which specific interests the individual customer has and hereby enables you to interact with the customer on a more informed level. It is important that the sales representatives have the best possible working tools when interacting with HCPs. Tablet detailing offers a lot of options to increase the engagement using video, sound and interactive elements – but more importantly it gives a simple way to capture information about the individual HCP, his/her patients, piotential and treatment preferences. This information is automatically captured by iPREZENTR™ and can be used to customize the subsequent approach and follow-up for the specific HCP. A unique feature of iPREZENTRTM is that all the data from your different sales channels iPAD, Self-Service site, Self-detailing and Remote detailing is captured and shown in the same data visualization module. The data capture is centered on time and place, which enables you to see all your digital activities in a brick at a given time period. When crossing this information with sales data it enables you to have better insight to which activities does generate what sales. Importing data from other digital activities is also a possibility. You can import your google analytics from your websites or your patient apps, to discover where are these activities used and how does it look seen from the bigger picture. For more details on the possibilities for data visualization please contact us with your needs. The digital revolution has changed the convention of business across all industries. In our industry we are also faced with new ways to market products and new channels to interact with doctors, patients and other stakeholders. For most companies this change is a journey. Many have begun a cautious migration from traditional mass marketing and sales reps to new multi channel approaches – more will follow. However, the real challenge for most established industry players is the management of this change – it is a people thing whether these initiatives will prove successful and sustainable. eHealth Nordic is founded by Janne Pamsgaard, who has more than a decade of experience in management positions in the pharma industry predominately working with international/global digital and educational concepts. The eHealth Nordic team consists of ex-pharma people who all have vast experience in initiating, developing and implementing international concepts within numerous areas. 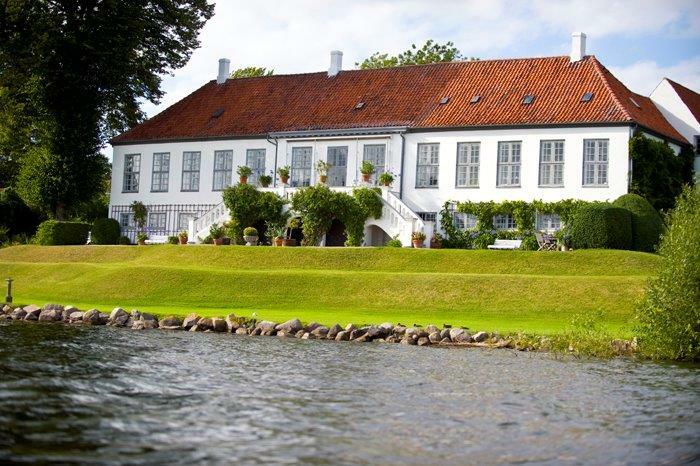 We are located just outside of Copenhagen, Denmark with employees in both Denmark and Sweden. We work with international clients, pharmaceutical headquarters, regional offices and local affiliates. Or send us your contact details and we will revert within 24 hours. Send us your details and we’ll get in touch withtin 24 hours. eHealth Nordic have extensive knowledge from working with digital activities in the Pharmaceutical industry for more than a decade. The team consists of ex-pharma people who have worked in global management positions within Sales, Marketing, Training and Education. We are located just outside of Copenhagen, Denmark with employees in Denmark. We work with international clients, pharmaceutical headquarters, regional offices and local affiliates.